For as long as I can remember, I have been obsessed with food and had the urge to be creative in the kitchen. My first baked good was a lemon meringue pie from scratch, and I was so proud of it. Since my parents were not into cooking, my education as a cook/baker was pretty much on hold until I was in college. I remember being snowed into my apartment and teaching myself to cook by watching the Food Network 24/7. I was an art major, and worked very hard to develop my skills in the visual arts, never even realizing at that time that food was my true medium. I also enjoy spending time with my husband and 3 children, reading, shopping, and watching cooking shows with my bulldog. In college and afterward, I became interested in the Pillsbury Bake Off (probably from watching it on tv!). It was kind-of an unrealistic pipe dream, that I never actually expected to realize. After many years of entering, they finally chose one of my entries. It was the year of “the voting,” which was infamously exhausting, but I was lucky enough to receive enough votes to become a Finalist in Las Vegas. The experience changed my life, and mostly due to all of the wonderful cooking contest friends I made there! I heard about CCC there for the first time, and as soon as I got home…signed right up. Truly the best part of contesting is the friendship of like-minded people that I just adore. I get so excited whenever my CCC friends win, and they are always there for me with cheers and support as well. 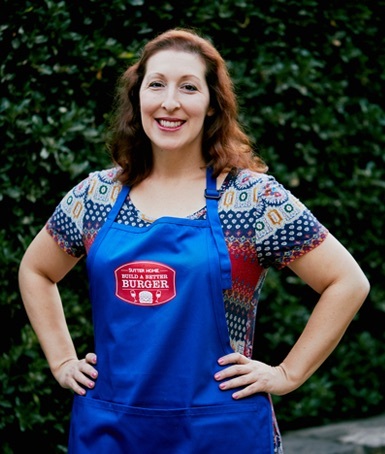 Some of my favorite contests and wins include Grilled Cheese Academy, Gilroy Garlic Festival, Sutter Home’s Build a Better Burger, MLF Strut Your Duck, the PBO, and of course The Great Holiday Baking Show. Being on ABC and filming in England was such an amazing experience, and I became a much more proficient baker as a result. Winning was really the “icing on the cake.” Being on Good Morning America was also a highlight for me, even though LIVE television is nerve wracking. My funniest contest win would have to be my first, a Premio Sausage contest in which I won a year of sausage. They sent it all at once…frozen. We didn’t have room in the freezer for it all, so I had to keep some in my parents’ house. Also notably, my dog won $10,000 in the Olivio Goodness photo contest by being adorable, and then spent every cent of his hard earned prize at the vet the next month. Contesting saved his life! I am so honored to be chosen as the 2017 Cooking Contest Central Hall of Fame inductee. What a great way to end a great year! Thank you so much. I treasure all of my fellow contesters and cooking buddies.